Sai In My Breath: Sai Experiences of RAO SAHEB V. P. IYER as Naratted by Mrs. Hirabai Iyer. Sai Experiences of RAO SAHEB V. P. IYER as Naratted by Mrs. Hirabai Iyer. In Shirdi, near the temple of Sri Sai Baba is the Lendi garden. There are a few Samadhis to the right side of the entrance of the garden and one of them is of Rao Saheb V. P. Iyer. He was my husband. He breathed his last at Lakshmiwadi which is four and a half miles from Shirdi - Kopargaon Road. I was at Lucknow at that time when I got a telegram informing me about his death. I wished to see the place where he had passed away and I went there. The children and I reached the place four days after his death. When the people of Shirdi knew that I had come to Lakshmiwadi, many came to console me and talked about my husband. Mr. V. P. lyer was a Sugar Technologist. He worked at various sugar factories. I had settled in Lucknow for the sake of the education of my children. When the contract for his work was over, my husband would come and stay at Lucknow till he again got a contract for a job in another sugar factory. For the 1943-44 sugar seasons, he did not have a job and so he was at Lucknow. He was not worried about it for he had absolute faith in Baba. He said that why should he worry, for Baba will do what is best for him. He was happy that he had more time now to pray to Sai Baba. Before having his meals he would offer the food to his beloved Baba. He would have all the various dishes served in the Thali, even raw onions and salad and offer the food to Baba. He would sit with eyes closed for a few minutes and then start eating. When someone told him not to offer raw onions, he replied that Baba would like it because it was a side dish for the poor. He had sent applications for a job and he got one in November 1944. He got a contract to work in the Lakshmiwadi Sugar Mills, at Lakshmiwadi near Kopargaon. When he saw the letter he said "Baba's grace is great and he has called me near him". He went to Lakshmiwadi and joined duty. He was happy for, now he could go to Shirdi whenever he got time. He often went in the evenings and returned late at night. As he stood in prayer at Baba's Samadhi he forgot everything. Many a time people there reminded him that he should go home as it was getting late. With great reluctance he would leave the Mandir and return home. His only wish seemed to be near Baba all the time. His desire to be with Baba was so great that he wrote in the letters to me that he wanted to stay at Shirdi and not leave the place. When his friends there heard this they advised him against it. They told him that he cannot think of such a thing. He must work and provide for the family till the children are grown up and able to look after themselves. His only reply was that he did not want to leave Baba and go, and that he wanted only to stay at Shirdi. In May 1945 the season was over and his work there was finished. Mr. Iyer wrote a report and submitted it to the factory management on the 26th of May, and thought of leaving Kopargaon on the 27th of May for Lucknow. Two of my sons had gone to Lakshmiwadi to spend a part of the summer vacation with their father. So they were there during his last days. 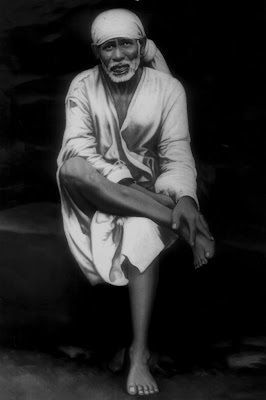 On the evening of the 26th, he went to Shirdi to have the darshan of Baba. The Mandir was not as it is today. It was small. Only the Samadhi of Sai Baba was there and there was no statue. He stood near a pillar in front of the Samadhi with his eyes closed. Sometimes tears would come from his eyes and he was not conscious of his surroundings. Some persons tried to talk to him but he did not respond. At about 9 pm. he came out of the trance. With great reluctance he left the Mandir to return home. Since he was leaving Shirdi, he said good-bye to the many persons whom he knew. He felt no difference whether they were rich or poor. All were the same to him. When he said goodbye, tears were shed on either side. He reached home at about 11 pm. and after dinner went to bed. At about 2 am. he woke his sons and said that he was ill. The neighbor was informed and he called the doctor The doctor came and diagnosed it as cholera and gave medicine. By morning he had become very weak. By noon he was only half conscious. He was lying quietly with eyes closed. At times he would open his eyes and look at Baba's photo which was on the opposite wall. He was oblivious of his surroundings except for Baba At about 4.30 pm. he opened his eyes and beckoned to the person standing near him. When that person went to him and asked him what he wanted, he made a sign that he wanted the picture of Sai Baba. It was removed from the wall and brought to him. He opened his arms and with his eyes indicated that the picture should be put on his chest. He then embraced Baba and said "Baba, Sai Baba, Baba" and smiling, breathed his last. When the people heard of the death of Mr. Iyer, they were shocked and grieved, for the night before he was well and now no more. Large number of people came from Shirdi walking, not minding the distance and the time for they all loved him. He was cremated late at night. The people of Shirdi approached the Samsthan and requested that a Samadhi be built of Mr. Iyer and they agreed. His ashes were buried and the Samadhi was built and the name and date were engraved on it. Baba heard the prayer of his Bhakta and fulfilled the wish and kept the loving Bhakta near him forever. Baba has looked after me and my six children. They are all educated and well placed. All are married and have children and are devotees of Sai Baba. I submit to His will and have had no fear for I have complete faith in Sai Baba.